I'm Daniel Bastos, a professional painter and decorator established in the Wimbledon and South West London area for over 10 years. I place exacting and high standards upon myself in the quality of my work and take great pride in the painting and decorating I do… it's getting the detail right that makes all the difference to me, and all the difference to you. 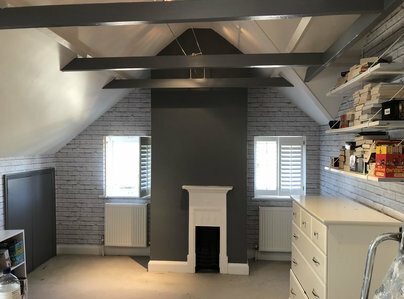 I take on work throughout Wimbledon and Merton, across South West London and Surrey and welcome all kinds of decorating projects from a single room to the whole house. I have built up a strong list of very satisfied clients who I work for regularly. Consequently a large part of the painting and decorating projects I undertake come through referrals and recommendations. I currently have clients stretching from central London to Guildford. It is important to me that I provide a friendly and efficient service to the very highest standards, ensuring I meet your precise requirements. A quality painter and decorator. Daniel was employed to wallpaper our living room and to paint the ceiling and skirting boards. Additionally the wooden garage frame needed to be 'made good'. Subsequently the frame and door were painted. All workmanship was excellent including smaller jobs not mentioned above. Communication and timing were good. At the end of each day all areas were left tidy and clean. Always cleaned up after each day. Polite and explained what the organised plan for the day would be. When problems happened, he explained how to overcome issues in an organised fashion. We felt confident to leave the house without worry. External decoration of three storey house to a very high standard. Daniel has completed much decorating in my house inside and out. Work is always carried out to a high standard and the place is always left very tidy. Daniel decorated our study involving lining the ceiling, stripping off paint back to the wood on the window and repainting the whole room. He was highly professional and friendly. He took great pride in his work, which was to a high standard. His timing keeping was spot on and he tidied up each evening. I will use him again. We had three rooms decorated including floor sanding and we were very pleased with the result. Daniel was very conscientious and attentive to details.